You are about to enter the country; you know where the pavement ends and your AT&T cellular dies? DaySpring Farm is located in southeastern Ohio in Morgan County--one of more scenic and rural counties in the Appalachian foothills. The nearest town to the east is McConnelsville on the Muskingum River, south of Zanesville, hometown of Zane Grey. If you are in the neighborhood of McConnelsville, you have several choices for local dining. The local County Fair, celebrated for more than 150 years, is one of the highlights of the year and is held in late summer. The nearby Crooksville-Roseville Pottery Festival is another annual event. Because of Morgan’s Raid, McConnelsville hosts an annual Civil War reenactment and encampment. Check out who appeared in the first reenactment. My great-great-grandfather, John Weaver, was held hostage by General John Hunt Morgan in July 1863 before being released on the other side of the river. When you are near the Muskingum River, check out Rokeby Lock No. 8, a state historical site, which allowed the river to be navigated by steamboats starting in the first half of the 19th century. If you are curious about the current local NEXRAD weather conditions, click here. Built on the site of an old log cabin, the main dwelling is a rustic story and half Cape Cod house of 1,562 square feet, built circa 1892 by Davey Frash, a local carpenter who served in the Civil War. Given that the chimney goes up through the middle of the house as opposed to being on the exterior gable of the house, he may have been German or certainly inspired by this style. Planted in the early 1930s, the orchard consists of apple and Kieffer pear trees (for preserves) plus five or six bee boxes added in the 1970s. In the garden nearby, my mother raised many different herbs including horseradish and anise for making springerle. The larger outbuilding, now a garage, was built in the 1980s. One end of it was a salesroom for selling Christmas trees. As members of the Ohio Christmas Tree Association, my father and mother, John V. and Hope S., operated a choose-and-cut your own Christmas farm called DaySpring Christmas Trees; Dad took customers on a wagon behind his Farmall B tractor out into the tree field and Mom had cookies and hot mulled cider waiting upon their return. My cousin, Kim, helped make wreathes. My mother also grew herbs and wrote an herb column for the local county newspaper. Nostalgic times, those. Geologically speaking, the property lies above the relatively shallow Marcellus Shale distribution of upper Devonian black shale; prior shallow work (about 4400 feet) was done in the Clinton Formation during the early 1980s (API #22151) which caused a hillside to slip--it's shale from the Conasauga formation. While gas was found, there was no oil at that depth. More recently, though, companies such as Appalachian Geophysical Services LLC and Artex Oil Company have expressed interest in deeper hydrocarbon (i.e., oil and gas) lease explorations below the top of the Queenston formation. In spring 2013, Artex undertook this deeper drilling, around 7700 feet, would be in the Cambrian and might include the Beekmantown dolomite or the Rose Run sandstone; the Rose run formation has accounted for about 70% of all drilling in the 1990s. However, 2010 AGS results seem to suggest that at this depth, the area was a deep valley. Besides, most well production "occurs in the first year and then declines proportionally over [the] life of a well," according to Natural Gas Forum. 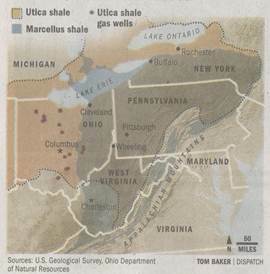 For more on the history of drilling, see Leonard Peacefull's "A Geography of Ohio" (1996) and here's a royalty calculator. There are five springs (i.e., Main Spring, lined with cut stones, on the west side of the road; Cow Spring, also west of the road, turning left on the lane from the road; and Kitchen Spring, High Spring, and Winter Spring in the Christmas trees northeast of the garage) which flow on the property. In the early 1950s, a pond was built in the valley below the house, but it washed out. Today, a new pond was built in the 1970s by Bob Smith and is still fed by Kitchen Spring, which was an auxiliary source of water to the eighteen foot well beside the house. 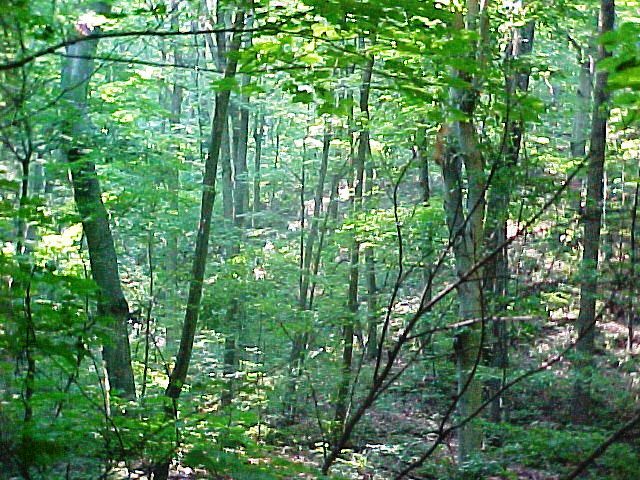 Native Americans (most likely the Shawnee, west of the Muskingum, and the Delaware, east of the river, along with some occasional Cherokee, Mingo, and Wyandot) roamed these woods during the previous millennia, following buffalo or other animal traces. They left behind artifacts. When the first white settlers arrived in the early part of the 19th century from Pennsylvania, they clear-cut the forest to make room for crops and pastures. Even later, much of the hardwood was cut for the coke furnaces in southern Ohio. Unfortunately, the rich forest soils eroded away. By the early 21st century, the NRCS's soil survey suggests that most of the land is: Lowell silt loam (30%), Westmoreland-Guernsey complex (21%), and Guernsey-Upshur complex (20%) as well as several other soil types. When the farmers let the land return to forest, oaks and maples predominated. So today, much of the property is hardwood woodland as you can see from the photograph below. If you are interested in the historical relationship between land use and wildlife, read Leddy's July 1948 Ohio Journal of Science article. Buckeye Forestry Services, founded by Gary Kaster, advised on harvesting some of the deciduous trees (mainly, white oak, red/black oak, beech, cherry, popular and some white ash) in 2003 before the anticipated gypsy moth invasion. This selective cutting provides excellent cover for wildlife. Many of the scotch and white pine trees are now quite tall and may eventually make good telephone poles, but most likely will become pulp fiber for paper. Not surprisingly, the farm is a research site for the Northern Forest Inventory and Analysis program of the USDA’s Forest Service. Their analysis, Ohio Forests 2006, is worth reviewing and is based on a 55 year old stand on the westside of the road which includes black locust, sugar maple, American elm, white ash, and some black cherry. Today, a small portion of the farm is put to commercial agricultural use: Dekalb corn (DK-658 in 2009; RX785VT3 in 2010; DK 6121 in 2011 and 2013), big rounds of hay (actually a blend of Dekalb alfalfa and reed canary grass), and Dekalb soybeans (planed in 2012 and 2014) in rotation for dairy cattle. Due to this nitrogen-fixing rotation scheme, these fields yield 120-150 bushels of corn per acre. 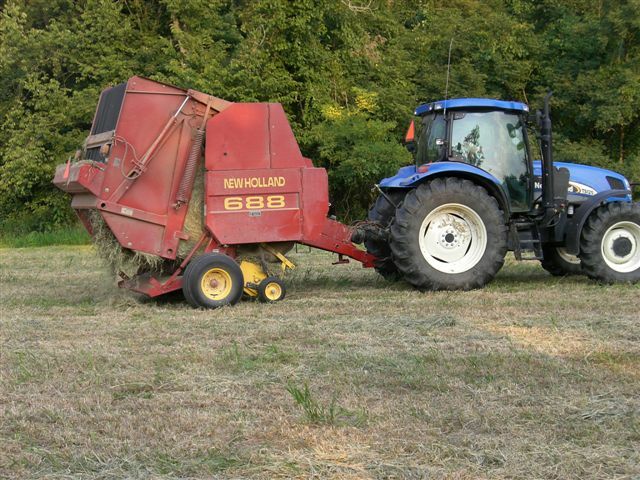 Mechanized picking means that waste grain is left behind for the wildlife throughout the year. However, much of the remaining land is going back to forest; you can see invasive smooth brome grass, which will be followed by pioneer trees such as ash and honey locust trees. So, not surprisingly, wildlife is abundant, too. In the late 1920s and 1930s, some trapping of rabbit, raccoon and groundhog was done. Today, small mammals include coyotes, groundhogs, opossums, skunks, and gray squirrels. Extirpated species such as panther and brown bear are rumored to be reappearing. Furthermore, we have seen numerous songbirds, raptors such as ospreys and turkey vultures, as well as wild turkeys and whitetail deer, especially. Although Ohio's Game and Fish says "The southeastern portion of the Buckeye State is the gold mine of Ohio's whitetail population," please note, however, that the property is posted no trespassing and there is strictly no fishing and no hunting without written permission. Hunting licenses can be obtained locally. Violations are reported to the Morgan County Sheriff's Office. By the way, the farm is also near the recently renovated covered bridge over a rocky gorge through which flows Island Run; to see the old Helmick Mill Bridge, which was greatly in need of repair, click here. It’s now on the National Register of Historic Places, the seventy-four long bridge employs a multiple kingpost style truss. 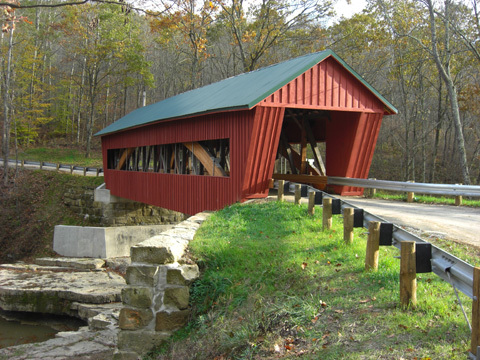 The original Helmick Mill bridge was built in 1867 by Samuel Price, who was paid $872, and one of the few covered bridges left in Ohio; well worth the detour on TR-269 to latitude/longitude: 39 43.183/81 56.534 (WGS 84); note, too, that some of Morgan’s Raiders, specifically Captain Williams and four of his men along with their horses and equipment, were captured and held in Joseph Helmick’s mill overnight. As an aside, Joseph, age 34, was from Pennsylvania according to the 1850 Census and worked as a miller; his wife’s name was Sarah. When you are in the neighborhood, be sure to see the village of Triadelphia, founded in 1838 by three brothers (Joseph, Nathan, and Samuel Roberts--my 4th great granduncles). In the early part of the 19th century, William Woodward operated a stop on the Underground Railroad; it is rumored that the red brick house, further out County Road 74, built by Southard family circa 1835 had an underground tunnel, which exited through a cave about half a mile away, as part of the Railroad. The Underground Railroad certainly did operate in this area, starting from Marietta, across the river from a major plantation, Henderson Hall; slaves simply swam across. Then, they came up the west side of the Muskingum River to Oil Spring Run and cut across country to Deavertown via Triadelphia, according to Lorle Porter's A People Set Apart (1998, p. 268). If you want to read more about the Underground Railroad, click here. Speaking of railroads, today it is hard to believe that this "village" had passenger train service four times a day as recently as the late 1920s.